Miller was collecting laundry, but upon going to his battle station, found it unusable, and was ordered to help carry the wounded off the deck. Finding a loaded but unattended.50 caliber anti-aircraft gun, Miller took control of it and began firing at the attacking Japanese planes, even though he had no prior training in operating the weapon. During the battle, he shot down at least one Japanese aircraft before he ran out of ammunition and was ordered to abandon ship. A week later, he was assigned to the Indianapolis (CA-35) and would not return to the US until late in 1943. Finally, on May 27, 1942, Admiral Chester W. Nimitz personally awarded Miller the Navy Cross aboard Enterprise (CV-6). In his address, Nimitz noted that "This marks the first time in this conflict that such high tribute has been made in the Pacific Fleet to a member of his race". 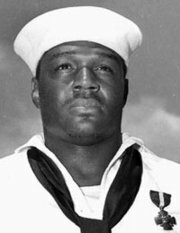 Only one month earlier, on April 7, 1942, Secretary of the Navy Frank Knox issued a directive that African Americans were to be enlisted in general service in the Navy, though that branch of the military continued to remain segregated.